Investors have been lukewarm to the FMCG and pharma sectors. But the future looks brighter than the immediate past. The pharmaceuticals and fast moving consumer goods (FMCG) sectors were the classical “defensive” sectors that insured investors against volatility elsewhere. But over the last year and more, a slew of factors has intervened and turned the two sectors, long adored by investors, into also-rans. Result: the bull run, that has driven up valuations almost across the board, has largely bypassed companies in these sectors. The numbers are telling. In this year’s BT 500 list, which ranks companies on the basis of their market capitalisation, Hindustan Unilever, still the country’s largest FMCG company, has fallen to the #16 position from #7 last year, while ITC, Nestle and Dabur have fallen from #6, #40 and #51 to #10, #58 and #70, respectively. In the pharma pack, Sun Pharmaceuticals has fallen from #28 to #36, Cipla from #24 to #45, Ranbaxy from #38 to #48 and Dr Reddy’s Laboratory from #37 to #59. “The growth rates both in pharma and FMCG are far too low and don’t compare with high growth industries like telecommunication, engineering, retail and real estate,” says Amod Karanjikar, analyst at Edelweiss Capital. But players in both sectors feel the future will be brighter than the immediate past. And they are all restructuring, reinventing and repositioning themselves to ensure that (see A Ray of Hope). Several Indian pharma companies are hiving off their long-gestation, high-risk drug discovery businesses into separate companies. DRL was the first off the block and set up a separate drug discovery unit way back in September, 2005; Sun Pharma followed suit six months later. In the last six months, Nicholas Piramal, Ranbaxy and Wockhardt have decided to hive off their drug discovery units. “This will not only help these companies derisk their generics business, but also support capital mobilisation in the newer ventures in future,” says Komal Sharma, Managing Director, Lupin, the country’s sixth-largest pharma company. These moves are making Dalal Street happy. Says Karanjikar: “The drug discovery units at these companies will now get a focussed attention.” And here, they will enjoy a significant advantage over their MNC rivals whose R&D laboratories are located in the highcost western markets. According to estimates, the cost of a research scientist in India is only about one-sixth of that in the US. Boston Analytics, a Boston-based research company, estimates in a recent report that revenues from drug discovery and development in India will touch $3.3 billion (Rs 13,200 crore) over the next two years, from $2.5 billion (Rs 10,000 crore) now. Then, several proprietary drugs— among them Pfizer’s blockbuster cholestoral-lowering Lipitor, which gives it annual revenues of $13 billion (Rs 52,000 crore)—will go off patent over the next half-a-decade. This will provide a fantastic window of opportunity to Indian drug majors like Ranbaxy, DRL, Cipla and others to consolidate their positions in the US and Europe. The future is not as bleak as it looks. Both pharma and FMCG companies are taking steps that are expected to pay off soon. In addition, there is a large domestic market, worth over Rs 20,000 crore annually, that cannot be ignored. This market has grown at a CAGR of 10 per cent over the last five years, and is expected to accelerate to 13-15 per cent in the next five. “We cannot take our eyes off the domestic market,” says Lupin’s Sharma. More of the Same Indian FMCG companies had gone through a round of restructuring in the late ’90s and early 2000s when several of them sold their non-core businesses. These companies are now tapping tax holiday zones in Himachal Pradesh, Sikkim and Uttaranchal, expanding into the front-end retail business, setting up greenfield ventures overseas and also making large acquisitions abroad. Godrej Consumer Products, for example, kicked off production of hair dyes and other toiletries in Sikkim in March this year, and ITto-FMCG major Wipro spent Rs 1,010 crore to acquire Singapore-based FMCG company Unza Holdings. His optimism is based on sound numbers. 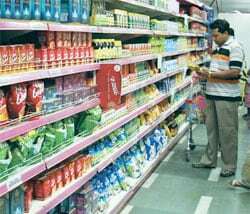 The consensus among analysts is that the Rs 50,000-crore FMCG industry in India will grow at 10 per cent CAGR over the next five years. “The practice of setting up manufacturing facilities in tax holiday zones will allow FMCG companies to maintain margins,” says Milind Sarwate, Chief (HR & Strategy), Marico, which manufactures and markets the popular Parachute, Kaya and Mediker brands. That’s one reason why many FMCG players are so bullish about the future. “I expect the FMCG sector to record a double-digit growth over the next year,” says Godrej. In a bid to de-risk the business model, many FMCG companies are also scouting for markets in new geographies like Bangladesh, Egypt and other emerging markets to boost their revenues. “Many emerging markets offer massive growth opportunities; there is also limited competition in these markets, making them very attractive,” says Hemant Patel, FMCG analyst at Enam Securities. Similarly, the expansion into retail may bring in big bucks for some FMCG companies. A year ago, Britannia Industries acquired a 50 per cent stake in the Bangalorebased CCD Daily Bread, which will ease Britannia’s entry into the premium breads, cakes, high-end readyto-eat foods and snacks segments. In March this year, Dabur announced its entry into the high-growth organised retail market through a wholly-owned subsidiary, H&B Stores, where it plans to invest Rs 140 crore by 2010. The FMCG players are also pinning their hopes on the expansion of the organised retail biggies. "FMCG companies will be the biggest beneficiaries of the retail revolution spawned by the likes of Reliance, Bharti and the Future Group," says Sarwate of Marico. "These are high growth areas and will definitely yield results in the longer term," say FMCG analysts. The Disconnect Not many analysts are ready to link the underperformance of the FMCG sector in the stock market with financial performance. "Most FMCG companies have shown handsome increases in profits," Godrej points out. He contends that the FMCG sector, being a steady-growth industry, is bound to trail the stock market whenever the Sensex does exceptionally well. The implication: the poor performance on the stock market is not a reflection of either its performance or its potential. That rationale holds for the pharma sector as well. In fact, both sectors are non-cyclical and enjoy steady year-round demand. The wild card for FMCG and pharma companies could be earlier-than-expected benefits accruing from a spate of domestic and overseas M&As. Many of these will result in better valuations going forward. Over the last year, apart from the Wipro-Unza deal, DRL has acquired betapharm, Ranbaxy has taken over Terapia, UB Group has bought Whyte & Mackay and Godrej has gobbled up Keyline. Even if only a few of these transactions pay off, they will provide a tremendous boost to the two sectors. But these, and the other initiatives show that the two sectors are not taking the relative bad times lying down. Yes, the appreciating rupee and rising crude prices spell more bad news for the two sectors, but analysts are near unanimous that the worst is over and that the way forward will be brighter.